A pleasant trip cut short when I felt a Horsefly biting my hand as I was taking a photograph. Cloud early, then hot and sunny. This is a first for my site; a hoverfly larva. As you can see, it is surrounded by dead aphids. 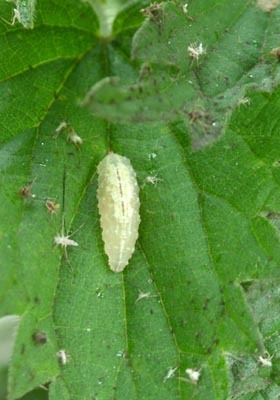 Each hoverfly larva is said to consume around 400 aphids before it pupates. About 1 cm long. Two purple heath flowers; Bell Heather - Erica cinerea - on the left and another shot of the purple Heath Milkwort. The Polytrichum moss has just 'flipped'. The previously upright capsules have now tilted in preparation for spore dispersal. The spikes to lower left and right are Eyebright. This is one of the Dor Beetles; around 12 mm long. 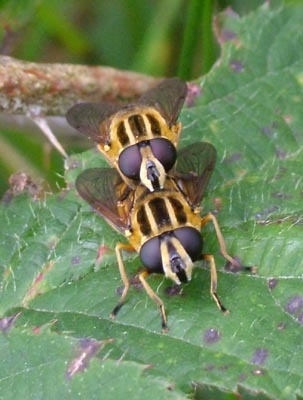 Two Helophilus pendulus hoverflies 'in cop'. It is interesting to compare the eye shapes in the male and female. I note the Bramble has some rust. It was interesting to spot this completely white Common Spotted Orchid. It would be interesting to see this in UV light, though. Not exactly sure what's going on here. A young Willow sapling was covered with black ants running up and down the branches. The small wing that can be seen to the centre left might give some clues: It looks like an aphid, so there might have been some 'milking' taking place..